If you have read a Christmas feature in an Australian blog, newspaper or magazine in the last few years, then chances are, you've seen paper boat press artist Kylie Johnson's lovely ceramic stars, birds and decorations hanging from mantles, Christmas trees, and adorning gifts. 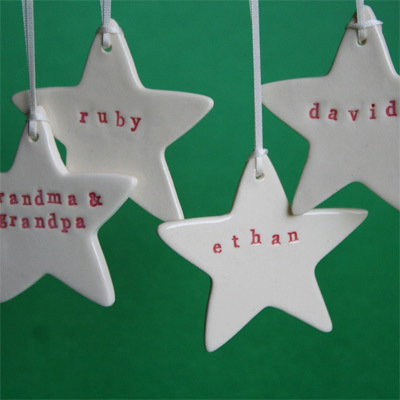 They are a super-stylish way to decorate for the festive season, and the personalised star ornaments in particular will become family heirlooms. My girls each have one hung on their bedroom walls throughout the year. 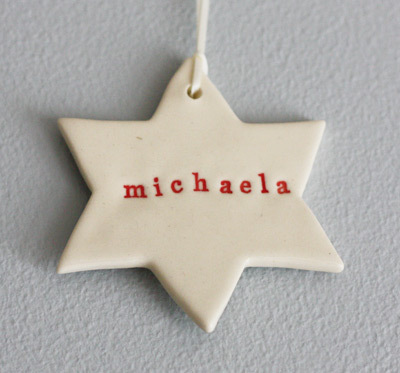 This month for our monthly Lucky Door Prize, Kylie is giving away ten paper boat press ceramic personalised star ornaments to two Bondville monthly newsletter or daily email subscribers! One subscriber will receive six personalised stars (RRP $95.70) and the second subscriber will receive four personalised stars (RRP $63.80). Look out for the winners in the monthly newsletter, coming your way in the next few days. Read more about paper boat press here on Bondville. PS: to celebrate the opening of the paper boat press store in Brisbane in late 2012, Kylie is offering readers a 12% discount on all stock in the online store before 31st August 2012. Quote the word TWELVE in the discount code section and update your shopping cart. Lucky us! 4. The two prizes consists (1) six personalised ceramic 5-sided star ornaments RRP $95.70 plus postage and (2) four personalised ceramic 5-sided star ornaments RRP $63.80 plus postage from paper boat press. 5. Lucky Door Prize winner will be notified in the Bondville Monthly newsletter, sent to subscribers the week commencing 13th August 2012.